This is the way we roll! With our RDO roll up garage door motor that is. A 24V DC high-torque motor, operating so quietly you’ll need to look at the door just to be sure that it’s moving. With an RDO not even power outages can close you down. Its reliable battery backup will keep you coming and going like there’s no tomorrow. All this opening and closing had better be safe and secure. Utilising CENTURION’s ultra-secure code-hopping remote controls, and coupled with its anti-crushing sensitivity, the RDO has you covered. The motor is mounted on the inside of the drum, giving no exposure to dangerous moving parts. The sensitive anti-crushing system technology adds to the safety features of the system making it atruly safe garage door motor. Look, Ma, no hands! 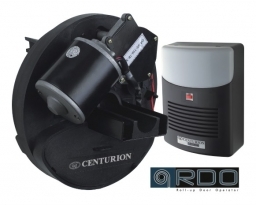 If you forget to close your garage door, the CENTURION RDO will do it for you – if you have activated the Autoclose feature. RDO sensors ensure that your garage door will never close on your child, car or pet – if an obstruction is detected the door will stop and reverse immediately.